An Obscure Law Makes the U.S. President a True Financial Dictator. Most investors are familiar with the fact that President Franklin Roosevelt closed all of the banks in America and confiscated all of the privately-owned gold by executive order in the early days of his administration, which began in 1933. Presidents since then have seized assets from countries such as Iran, Syria, North Korea and Cuba and imposed sanctions on Russia and many other countries by executive order. Yet, relatively few are familiar with the statutory authority for these orders. The president does not need an act of Congress to support such extreme actions. The laws have already been passed and the president has standing authority to act like a dictator with regard to financial assets. The first such statute was the Trading With the Enemy Act of 1917, TWE. This was used to seize German assets in the U.S. during the First World War. It’s how the U.S. took control of Bayer Aspirin from the German firm Bayer AG. TWE was the authority FDR used to close the banks and seize the gold. It’s not clear whom FDR considered the “enemy” when he used TWE; probably private gold hoarders. But, in 1977, the Congress enacted an even more extreme version of TWE called the International Emergency Economic Powers Act of 1977, or IEEPA. This is the equivalent of a nuclear weapon when it comes to financial warfare. IEEPA allows the president to seize or freeze any asset or block any transaction if the president deems it to be necessary in the case of a national emergency. The problem is that “national emergency” can be defined broadly to include trade imbalances, lost jobs or any other economic adversity. 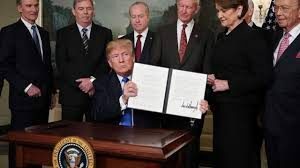 This article describes how President Trump may now use IEEPA to block a variety of Chinese deals in the U.S. in retaliation for Chinese theft of U.S. intellectual property. With the U.S. using its nuclear option in financial warfare, investors should hope that the Chinese don’t respond in kind.